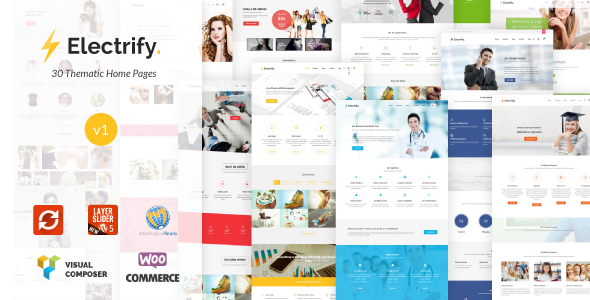 Electrify is a Multipurpose WordPress theme which going to electrify all of you. Create websites without touching single of code (multipage or single page). Electrify is Responsive & Retina Ready. It contains 30 thematic home pages and packed with unlimited features. Electrify pack with premium plugins like Visual Composer, Revolution Slider, Layer Slider and Isotope (Save $67 with this theme). You can create any type of website with this theme in few minutes. It contains over 100+ Elements with minimum 5 variations for each. Also Change the appearance of your site with just open click. You can choose any color and skin from electrify theme option panel. It will help you to create really unique. It also supports WooCommerce, WPML, and Contact Form 7 etc… Electrify totally contains 100+ pages, 20 + Sliders, 7 Post Formats (Audio, Video, Standard, Quote, Link, Image, Gallery), Unlimited Headers, Mega Menu etc. Check out electrify features below. 30 Thematic Home Pages (More pages coming). Header builder, take full control of your site header. 1200+ Icon with Icon Manager for both visual composer and mega menu. Advance drag and drop media manager, create gallery post, video post or audio post is much easier. Audio & video playlist support. Powerful Option Panel, customize all the aspect of the site appearances with ease. One click demo, setup like our Demo site with just one click. Item Reviewed: One WordPress Theme with 30 Thematic Home Pages 9 out of 10 based on 10 ratings. 9 user reviews.